If you’re deep in the throes of caregiving, you probably hear the, ‘Take time to care for yourself,’ advice from multiple people. It sounds like an oxymoron. Who’s got time for that? You shake your head and let the suggestion roll off your already drooping shoulders. Who has time for ONE MORE THING when a loved one’s life hangs in the balance? Maybe you care for someone whose disease moves in agonizing increments, one stolen memory at a time. 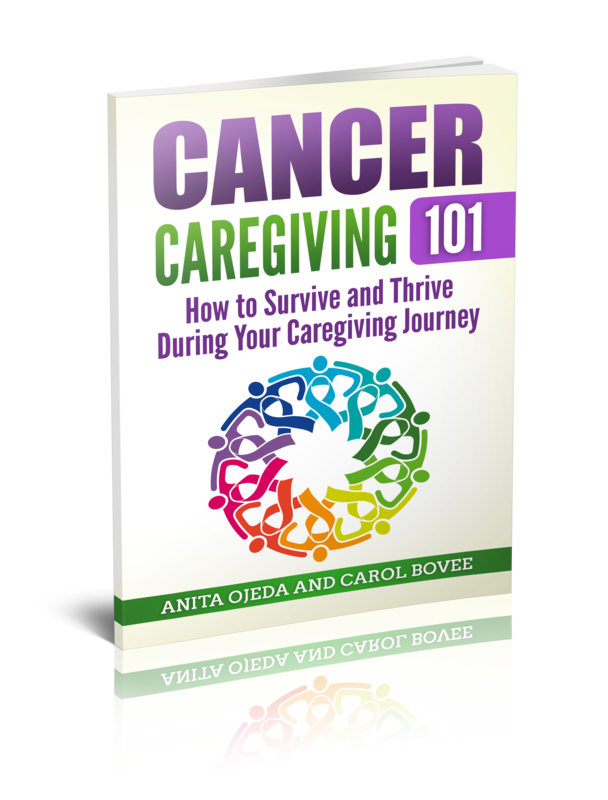 Your caregiving tasks might seem so light that you don’t notice the build-up of burden. And so you don’t think you NEED to give yourself any special attention. Trust me, you STILL need to practice healthy self-care. Caregivers risk endangering both their physical and mental health when they fail to take care of themselves. I know. It happened to me. During my husband’s cancer journey, I failed to take care of myself. Sure, I cashed in on a massage gift certificate that some kind soul gave me. One visit to the massage therapist in a year-long caregiving stint does not equal self-care. I quit exercising and started drowning my sorrows in eBay therapy (if anyone ever comments on the number of Longaberger baskets in my house, I might shrug and say that I like baskets. Now you know the real reason). When eBay therapy wouldn’t suffice, I’d try Häagan Dazs® therapy. I should have joined a support group. That would have provided a much-needed self-care element to my life. And I never should have given up on exercise (although stress seemed like the perfect excuse for giving up something I didn’t like very much to begin with). The third Wednesday of each month we’ll share our stories and advice about caregiver self-care. Don’t let anyone convince you that the term ‘caregiver self-care’ is an oxymoron. It’s something that we need to systematically build into our caregiver journeys in order to avoid things like caregiver PTSD and compassion fatigue. I challenge you to take care of yourself! It’s so important to really take care of ourselves, even when a loved one is in crisis. If you’re interested in finding out more, join the 5-day Self-Care Challenge for Caregivers. It’s free, it’s easy, and in just 25 minutes a day (NOT all at the same time), you can take proactive steps to caring for yourself. In order to make this link up user friendly AND pertinent to caregivers and their needs, please make sure that what you link up follows the guidelines for the week. This week is for SELF-CARE FOR CAREGIVERS. If you aren’t sure if your link is appropriate, feel free to email me at anita at blessedbutstressed dot com and ask! This week’s spotlight shines on Dr. Michelle Bengtson, a neuropsychologist, writer, and caregiver. She interviewed a dementia caregiver, and in this post, the caregiver shares resources for dementia caregivers. Make sure you check out both the article and Dr. Bengtson’s blog!